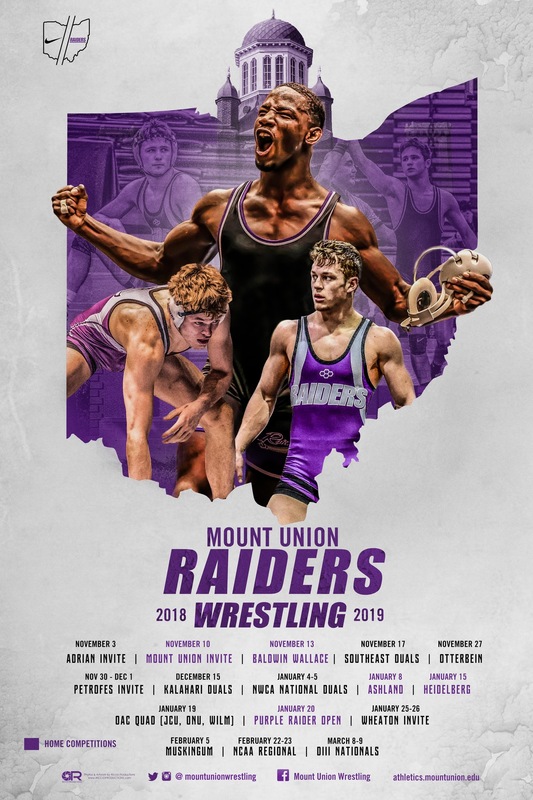 Mount Union, ranked No. 7 in the nation, will have four student-athletes competing Friday and Saturday at the 2019 NCAA Division III Wrestling Championships at Berglund Center in Roanoke, Virginia. Senior Jairod James (Bedford) along with sophomores Jordin James (Bedford), Antown Pugh (Copley) and Luke Hernandez (Nashport / Tri-Valley) will all compete starting at 11 a.m. Friday. Jairod James is the No. 2 seed at 174 pounds and the defending national champion and All-American at the weight class. He enters this year's meet with a 33-4 record and has won titles at the Wheaton-Pete Willson Invite and the NCAA Central Regional. James is just the second Mount Union wrestler to win an national title. His younger brother Jordin is making his first national meet appearance as the overall top seed at 133 pounds. He is 34-1 on the season and among national leaders with 14 technical falls. He also won individual titles at the Wheaton-Pete Willson, Messiah Petrofes and NCAA Central Regional tournaments. Pugh is the No. 4 seed at 157 pounds in his first national meet and is a perfect 31-0 this season with 15 pins. Pugh also swept individual titles at the Wheaton-Pete Willson, Messiah Petrofes and NCAA Central Regional tournaments. Hernandez is wrestling at 149 pounds and after placing at last year's regional is a national qualifier this year. He has a 29-9 record and placed second at the NCAA Central Regional along with winning the individual title at the Wheaton-Pete Willson tournament. Mount Union placed 10th as a team a year ago with a pair of All-Americans. It marked the fifth time in the history of the program with a top-10 national finish. The Raiders best finish at the national meet are eighth place finishes in 1994 and 2011. Current Mount Union head coach Josh Malave was a national qualifier on the 2011 Purple Raider team that finished eighth. A wrestler that places in the top eight is an All-American. This year's NCAA Championship is in Roanoke, Virginia, a place where Mount Union has history as the Purple Raiders won 13 national football championships and made 20 appearance in the game played in nearby Salem, Virginia, from 1993-2017.